Wallonia is one of the three regions of Belgium. It has a surface area of 16,844 km² and a population of 3.4 million. Together with Brussels, Wallonia is the region of Belgium where the predominant language is French.... as well as German, English, Dutch and many others. Wallonia is proud of its tradition of being open to others, which makes it a welcoming and multi-cultural region. Wallonia is a green lung in the heart of Europe and extremely popular with overseas investors. Its innovation, the quality of its research and the flexibility of its multilingual and highly technically skilled workforce are decisive factors in its appeal. These assets, together with its ideal location, make it one of the five most attractive European regions for overseas investors (Ernst & Young Barometer 2013). 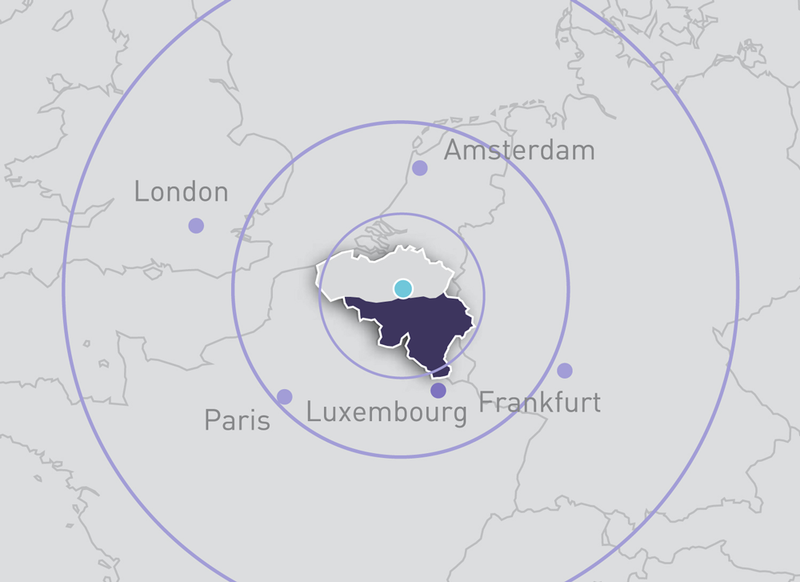 Located close to Brussels, the capital of the European Union, Wallonia has a strategic position at the heart of an extremely dense communications network. Just a four-hour drive will give you access to a market of 375 million consumers; distribution is facilitated by highly developed infrastructures including five multi-modal platforms at the gateway to Germany, the Netherlands and France. Wallonia is also one of the largest global exporters per inhabitant. Although Wallonia represents approximately 0.1% of global GDP, Walloon businesses represent 0.3% of global trade. Almost 70% of the global turnover of Walloon businesses is for export, one of the highest export rates in the world! By comparison, the European Union average is only 30%. When it comes to exports, Wallonia had average annual growth of 6% between 1996 and 2014, i.e. just behind the performances of Germany (6.3%) and the Netherlands (6.2%). This is above the performances of Flanders (5.6%), the EU15 (5.3%) and France (4%). Finally, 26,000 direct jobs were generated by overseas investments during the period 2000 to 2014 (with a marked acceleration over the last 10 years - during the launch and increasing influence of the regional economic development plan (the Marshall Plan and its successive versions). Almost 600 new investors chose Wallonia (of the 1,252 dossiers concluded), injecting €10.6 billion into the local economy. This success can be explained in part by the setting up of clusters in 2001 and competitiveness centres in 2005 to increase regional competitiveness in the sectors in which Wallonia already had potential. The aim of this policy is to develop a critical mass in promising business sectors and a level of excellence that can generate a new growth dynamic at regional level and place Wallonia on the European and international map. Further information on centres and clusters. Wallonia's average annual export growth of 6.3% in the agribusiness, transport and logistics, aeronautics-space, life sciences, chemistry and sustainable materials sectors over the last ten years has made Wallonia one of the best performing regions of Europe. In these sectors, Wallonia is well ahead of the average growth rate (4.1%) for exports in the EU15 and its four neighbours (Flanders, France, Germany and the Netherlands). To these six sectors should be added sectors such as plastics, photonics and digital technologies, which the Walloon government has made its new priority for the 2015-2019 term of office, and Marshall Plan 4.0. This combination of industrial tradition and innovation capacity is helping Wallonia to gain an excellent reputation internationally. With nine university centres, 130 higher education institutions, 300 research centres, six science parks and more than 11,000 researchers, Wallonia is known around the world for its ability to innovate and develop the products of its fundamental research. This enormous potential for creativity and innovation was internationally recognised in 2013 when Wallonia was designated "European Creative District" by the European Commission.